With over 60 years experience and real focus on customer satisfaction, you can rely on us. There's no job we can't handle and style we can't create. After completing your project, you also have the option to add patio lighting to your awning. 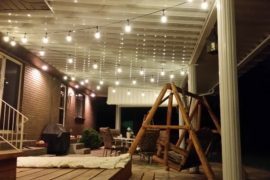 Patio lights add that perfect ambiance for outdoor entertaining. All our lighting products are LED and rated for outdoor use. Also, keep us in mind for your Christmas light projects. We have several large commercial displays that we build, and many houses that we install lights on. We have jobs all around the world from south Korea to Argentina to right here in Utah. one of our houses was just featured in a commercial for Mercedes Benz. It is our attention to every little detail that makes us different from everyone else, and we apply that in every project. 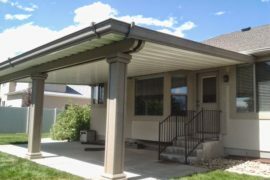 A stucco wrap awning can give you that truly custom look without the custom price. Give your home that one of a kind look and feel. All our projects are custom matched to your homes existing color to give it that special look you’re after. 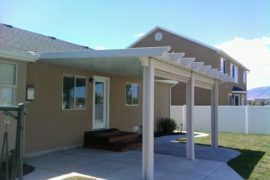 Our stucco awnings feature aluminum inserts that attach to the awning instead of wood, all our stucco material is backed by a full manufacturer warranty that is the best in the industry. Give our design team a call today and let us show you the endless options you have for that perfect outdoor living space. 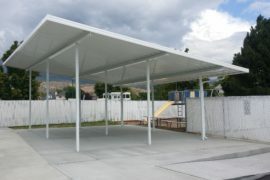 Free standing awnings offer another option when you can’t attach to your home. Many cases these are used to protect your boats, rv’s, and anything else you can think of. 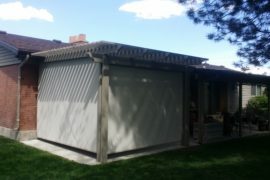 This style is our basic awning that is completely aluminum for that maintenance free project. All our awnings have a built-in rain gutter included, and the best warranty in the industry. Every awning we build uses an extruded aluminum milled frame work, that is superior in strength. We will never skip on strength or quality on any of our projects. That is the kind of attention we provide on every project, no matter how big or small it may be. We strive to be the best, and only use the best. Sun shades are one of our best accessories we offer. We use the top quality in screens so that it lasts a lifetime (we challenge anyone to rip or tear one) and never wears out. We have many sizes, colors, and options to choose from. Our screens offer that extra protection from the sun’s rays that sneaks in sometimes. We have basic sizes in stock, or we can have them custom made for any project and can even get them motorized. Let our design staff know what you’re after, we have an option just right for you and your budget. Sometimes you just can’t decide on what style you want, or maybe you have that perfect view you don’t want to lose. An open lattice is a perfect solution that adds the perfect amount of shade that won’t take away from your view. All our open lattices have that same cedar embossed aluminum to give it that wood grained look and keep it strong and maintenance free. Every detail is thought out in the design from providing a custom galvanized beam, to properly screwing every cap so they don’t ever fall out. All our post covers have a foam filled insert that adds more strength to them, and all material is engineered for our snow loads so you can rest easy. We have many styles and color options to match any house out there. AA Home Improvement from We Film Stuff on Vimeo. For those wishing for the advantage of a solid cover and a total different look, then the “SUN COUNTRY” is the choice for the distinctive homeowner. 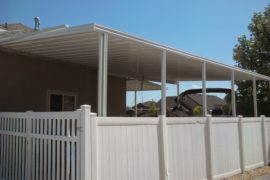 With the built-in rain system, choice of 4 colored embossed roof panels along with 10 different colors available for the perimeter of you patio cover. 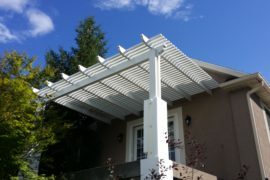 The PERGOLA awning is designed for the home owner who desires shade without the concern for the elements. Built with all aluminum structure, gives you the long lasting look of a wood product without the maintenance. Great service, installed within less than 2 weeks of our original bid. Looks amazing!! They had this completed in one business day. These guys did an AMAZING job! Rick came and gave me a bid along with a time frame for completion. 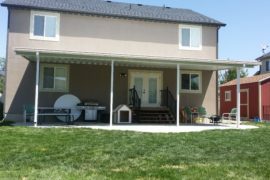 Doug came out and installed my new patio cover in that time frame and it turned out GREAT and it matched the bid to the penny. I couldn't be happier or more impressed. You will be happy with these guys. Thanks guys!